The KM3NeT computing model is based on the LHC computing model. 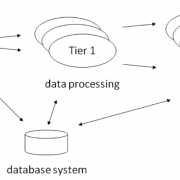 The general concept consists of a hierarchical data processing system, commonly referred to as Tier structure. KM3NeT will follow an open-data access policy. After a short period of priority access to collaboration members, the data will enter the public domain; with the exception of data taken during the engineering and commissioning period. The open-access data will consist of reconstructed events including calibration, quality parameters and experimental uncertainties; software and documentation of how to analyse the data will be provided in due time. KM3NeT will be operated as an observatory with observational campaigns by external users. Application with be evaluated by an externally appointed committee. Data are processed and stored on three computing centres: CCIN2P3-Lyon (CNRS), CNAF (INFN) and the ReCaS infrastructure.